Electrostatic spinning, or electrospinning, works by polymer solutions. As first step of the process, the polymer solution is placed into a pipette or a syringe, and then it is pushed to the tip of the pipette, or to a metallic needle (spinneret) by external pumping. Pumping is usually applied by mechanical pistons and generates a flow of the solution in the syringe. Syringes can be oriented both vertically and horizontally with respect to gravity (we mostly use horizontal electrospinning in our lab. The ranges of concentration of the polymer solution are generally between a few percent and 30% (polymer:solvent, w:w). The main reason why quite high concentrations are needed is because the spun solution has to exhibit good viscoelastic properties, given by a sufficient amount of entanglements which have to form between macromolecules in the solution. This aspect is one of the most fascinating of electrospinning, since unexpected physical properties can origin in electrified jets of entangled solutions. When a pendant droplet is formed at the spinneret, an electric voltage bias (up to 100 kV, most often of 10-30 kV) is applied between the tip and a collector placed in front of it, at a distance from a few cm to a few tens of cm. The bias is applied by means of a high-voltage generator. The applied voltage is gradually increased, the droplet elongates according forming an apex (Taylor cone), and finally electric forces overcome surface tension and a jet is produced. The velocity of the jet can reach values of a few m/s, and strain rates are up to 107 s-1. The solvent quickly evaporates from the jet, and solid nanofibers are finally deposited on the collector. Various collector shapes can be adopted including planar surfaces and rotating disks. 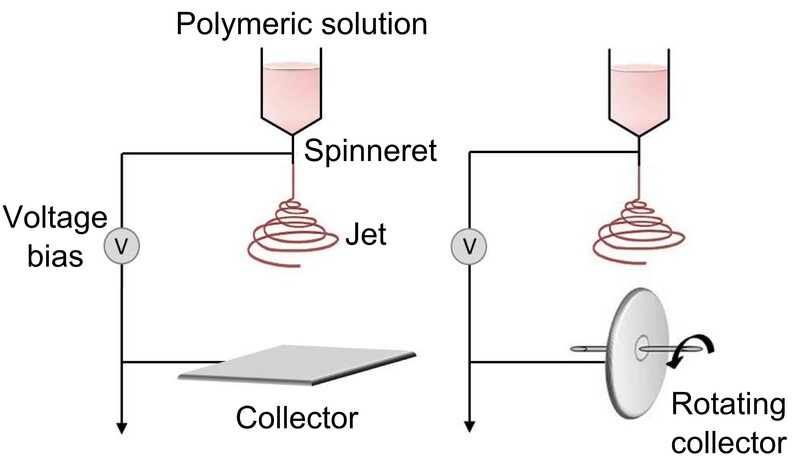 If optimized, electrospinning allows polymeric fibers to be produced, which show diameter ranging from many micrometers down to sub-100 nm, namely two-three orders of magnitude smaller than conventionally spun fibers. Blend nanofibers and core-shell heterostructures can be realized as well. Due to their high surface area, tailored porosity and topography, these nanofibers can be extraordinary tools for nanotechnology, with possible applications including, besides photonics, nanoelectronics, drug delivery, filtration devices, membranes, vascular grafts, protective clothing, sensors, and scaffolds for tissue engineering.